In today’s post, I’d like to explore some surprising recent findings about the abilities of animals in the area of analogical reasoning. Reasoning by analogy is central to the way we think, enabling us to use familiar concepts to solve new problems. When a catastrophic event strikes Wall Street, economists inevitably point to analogous historical disruptions in their attempts to predict whether we’re facing long-term troubles or a quick recovery. When lawyers advocate on behalf of clients in new realms such as digital media, they often ground their arguments in principles that evolved centuries ago to protect real property interests. When scientists explain the motion of molecules and other phenomena that we cannot directly perceive, they frequently turn to concrete examples such as colliding billiard balls or streams of water. One of the most common tests used to assess an individual’s ability to solve analogy problems is known as relational matching-to-sample or RMTS. 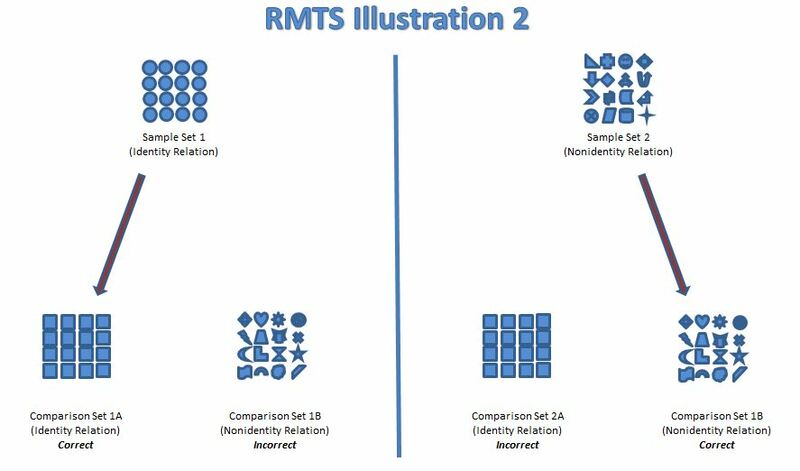 In its classic form, RMTS involves first showing the subject a sample set consisting of two or more objects that are either identical (for example, two circles) or nonidentical (for example, a square and a circle). Sets containing identical objects are sometimes referred to as reflecting the “identity relation” and those containing nonidentical objects are said to reflect the “nonidentity relation.” Next the subject is shown two comparison sets containing novel objects, one embodying the identity relation (e.g., two triangles) and the other the nonidentity relation (e.g., a rectangle and a triangle). To succeed, the subject must choose the comparison set that matches the relationship demonstrated by sample set. For instance, the correct choice for a subject shown two circles in the sample would be the comparison set containing the two triangles, whereas the correct choice for the subject initially shown the square and the circle would be the comparison set containing the rectangle and the triangle. RMTS is particularly well suited for testing the abilities of non-human animals, as it poses an analogy problem in a strictly visual manner, not relying in any way on linguistic skills. In essence, success requires the subject to not only make a “first order comparison” between same and different, but also to make a “second order comparison” by applying this underlying distinction to a novel environment. Many researchers consider this ability to lie at heart of analogical reasoning. Until recently, studies have suggested that humans and a select few great apes stand far apart from all other animals in terms of analogical reasoning abilities. While many animals can successfully distinguish between same and different shapes or colors, they tend to struggle when it comes to making second order comparisons of the sort required by RMTS tasks. Since only humans and some chimpanzees, gorillas and orangutans have performed well at RMTS testing, researchers have proposed that a “profound disparity” exists between the analogical reasoning capacity of hominids and other animals. For example, several studies have shown that some baboons and pigeons can learn to pass RMTS tests if they involve large-sample and comparison sets (e.g., comparisons involving 4 x 4 grids of 16 all identical and 16 all different objects), but that their performance rapidly deteriorates as the size of the grid decreases as well as when the distance between the objects in the grid increases. According to researchers, one reason why animals do better with larger sample sets may be that there’s a greater amount of variation or “entropy” between non-analogous grids in larger sample and comparison sets, which makes the task of distinguishing between potential answers easier. Notwithstanding these prior findings, however, two studies published in the last few months now pose a challenge to the “profound disparity” concept, suggesting that a suitable testing environment can showcase robust analogical reasoning skills in non-apes. 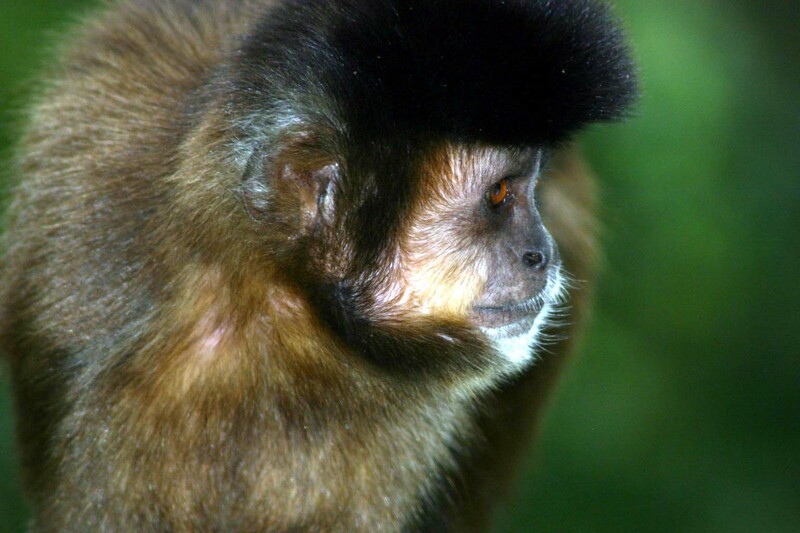 In the first study, which was published in PLoS ONE in August 2011, researchers led by Valentina Truppa and Elisabetta Visalberghi of the National Research Council in Rome, Italy, found that New World tufted capuchin monkeys (Cebus apella) were capable of solving RMTS tasks involving sample and comparison sets involving sets of as few as two objects. The research team studied five capuchin monkeys, testing them over and over again on RMTS tasks involving varying numbers of icons. While the specific tests varied, the general approach was to start by giving the monkeys trials involving a relatively small pool of different icons and, only if and when a monkey achieved proficiency (as measured by percentages of correct answers) over the course of thousands of trials, to introduce novel icons for comparison. Also, in one of the experiments, if the monkey did not ultimately reach the proficiency threshold on a two-icon comparison test, “entropy” was increased and the monkey was given an easier four-icon test. The current study demonstrates the acquisition of abstract concepts based on second-order relations by one capuchin monkey, Roberta. She was first successful with four-item stimuli and then with two-item stimuli, the latter being the most difficult condition previously thought to be mastered only by apes. Since her performance was robust across different types of stimuli and well above that of the other subjects, we can argue that relational analogies are very difficult for capuchins, but under specific circumstances not impossible. In a second study, published on September 20, 2011, in Psychological Science, a research team headed by Joël Fagot of the Centre National de la Recherche Scientifique at the Université de Provence reported that guinea baboons (Papio papio) can learn to perform surprisingly well at RMTS tasks … and then retain this ability over a 12-month period. In this study, 29 baboons with no language training and little or no experience with relational matching tests participated in various RMTS experiments involving geometric shape comparisons. 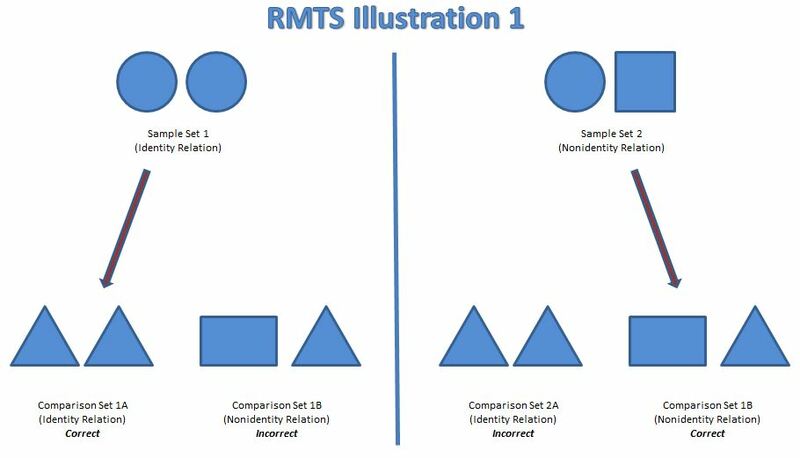 The first experiment consisted of classic RMTS trials, each involving a sample set made up of pairs of identical or nonidentical geometric shapes, and two comparison sets with new geometric shapes, with only one of the comparison sets matching the relationship demonstrated by the sample set. At first, the testing pairs were selected randomly from among 10 geometric shapes, but once a baboon had achieved an accuracy level of 80% or better in three consecutive sessions of 100 trials, new geometric shapes were introduced up to a maximum of 90 shapes by the end of the experiment. Six of the 29 baboons were able to make it to the 80% threshold level, and five were ultimately able to proceed through testing until they reached all 90 shapes. The second experiment included changes designed to make the challenge more difficult: the geometric shapes were moved further apart and, perhaps more significantly, in half of the tests the “incorrect” comparison pair, rather than containing all new geometric shapes, actually contained one of the shapes from the sample pair. In other words, even though this comparison pair was incorrect from the standpoint of analogy testing, it contained a shape that was directly linked to the sample set, potentially confusing the baboon if it was focused on the similarity of the shapes rather than the conceptual relationship between the shapes. 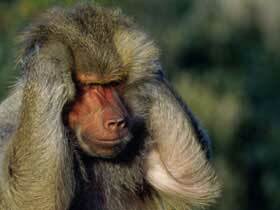 In spite of the enhanced degree of difficulty, all five of the baboons who participated – the same baboons who had been successful in the first experiment – performed at above chance levels throughout the second experiment (although, not surprisingly, their performance tailed off somewhat in the trials where the incorrect response shared a shape with the sample set). Finally, the research team retested the five successful baboons in accordance with the first experiment methodology after a one-year lapse during which the baboons had no practice at RMTS tasks. All five baboons reached the 80% success level far more quickly than they had the first time around, providing strong evidence that they had been able to retain their relational matching skills over this one-year period. As with the capuchin monkeys, the baboons were not naturals at these tests – they went through thousands upon thousands of trials and only gradually acquired their relational-matching skills. Once again, though, the research strongly suggests that there is not a bright line “profound disparity” between the capabilities of hominids and those of other animals, and that other animals can demonstrate the cognitive foundation necessary for abstract analogical reasoning. So, as in other areas, the more we explore the abilities of animals, the more we find that we have been wrong about what we thought were cognitive barriers. As we become more adept at designing experiments that are patiently conducted and thoughtfully tailored to the skills and natural adaptations of the specific animals we are studying (rather than the skills and adaptations of college undergraduates), we should continue to see the breakdown of additional barriers. How do we know it is analogical reasoning and not good old Pavlovian conditioning? I mean even in humans the analogical reasoning could be conditioning. This could be tested by giving humans analogical problems and watch the brain scans whether the same reward areas light up. Really good question, and I’m not sure that I can give you a fully satisfactory answer. I think one thing the researchers might point to would be the performance of the subjects on the “transfer tests.” In these tests, the subjects were able to pass trials where they had to assess the relationships between newly introduced shapes – ones they had never seen before (received conditioning on). In order to do so, it seems like they must have understood something about the relationships between the shapes. That said, the test subjects obviously had thousands and thousands of chances to gradually improve their responses to test stimuli, which makes me think that some sort of “conditioning” may have been at work as well. Also, it would indeed be interesting these sorts of tests linked up to brain scans. My cat reasons similarly, although he also finds that it helps to bite late-sleeping humans on the top of the head, since only awake humans give him food. So, be careful if you ever come and visit! Most people think that animals can’t reason .But that is incorrect. They can reason maybe not like us though, but they can do it. I forgot to mention something that animal reason and logic does not equal ours.